5793 labyrinths found. Showing 361-380. Sorted by country, state, city, then zip/postal code. The labyrinth is open in daylight hours but is best visited in the fall as there are few visitors to the small village of Bouctouche after September. In the winter it is snow covered. Ann and Ray, the owners of the inn. Contact the inn for details. If you should need to stop and ask for directions, ask where the French School is. 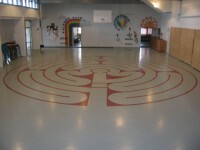 The Labyrinth is painted in an outdoors skating rink. It is visible through the ice but I must say that it is very slippery. And there is a possibility that it will be covered in snow during the Winter. Other than that it is available all the time, day or night and is wheelchair accessible. It is advisable to call the Carrefour Beausoleil in advance, but it is not necessary, just to be sure there are no other events taking place at the same time, especially if you are planning an event: 506-627-4125. Chartres replica - entrance of the labyrinth faces magnetic East. 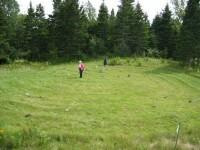 This is a 20 foot labyrinth that is portable and available to groups. I do sometimes offer public labyrinth walks. The labyrinth is in my backyard. The lines are made of flat bricks and tiles and the path is grass. The snow makes it impossible to walk; other than that it's walkable day or night. Chartres style, without the lunations. 45 x 40 feet approx. Located in Western N.B. near Maine, USA border. Take Trans Canada Highway Exit at Florenceville, Bristol, Bath. Travel Rte 105 to Bath. Exit 105 and head to Johnville. Staying right at Y, follow South Johnville Road, 5 kms from Bath. Labyrinth is on hill overlooking farm homestead. Just of Main St. in St. George. Store hours Mon. to Saturday, 10am to 5pm, April to Dec.
We are the only church on Richard Nolan Drive. You can't miss our steeple above the trees. The labyrinth is directly behind the church with lots of parking near by. It is directly connected to the walking trails of the City of Mount Pearl. Along the side of the Farmers Market is Church Street, for walking only. Full of fabulous shops, and of course home to Far-Fetched Gallery and their 2 labyrinths. 13.3klm from Pictou Rotary, on the Route 6 Sunrise Trail. Built among young poplar trees with a bench in the center. 44 32 49 N° Lat. ; 64 14 40 W° Long. This labyrinth that is one of three major healing tools available through a mobile healing centre. A more permanent location of the centre is open weekly for mental health consumers in the Halifax Regional area (Nova Scotia). Admission is free to these clients. Plans are being set to open a sister centre in Dartmouth, NS where the same benefits of the Halifax centre will be offered specifically to support health care providers (small admission fee). The public can also rent the healing centre (and its services) for retreats, group work, congregational gatherings, etc. Wheel chair accessible for Halifax permanent location. 7 Circuit labyrinth - Gaia - pathways approx. 14 inches, pattern done in blue hockey tape (she is beautiful!) may evenutally be painted on the cloth. Just off Highway #101 at exit 10 to Grand Pre. Tangled Garden is between the exit and the village of Grand Pre. Watch for highway signage. 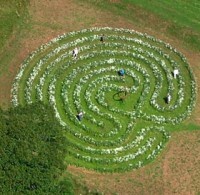 Open June through December - weather permitting - the labyrinth is planted annually. 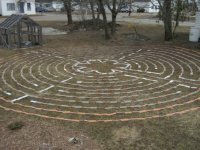 This labyrinth is located in the Newman Memorial Healing Garden, in front of the IWK/ Grace health centre on the corner of Robie and University. The park was built in memory of Norman Newman by a generous donation from his wife Barbra Newman in 2000. 7 circuit, painted on grey concrete church hall floor, with wide paths for easy use.